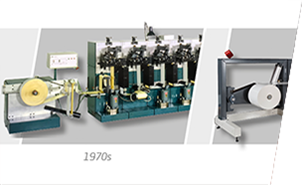 Nilpeter introduced its first inline flexo press in the late seventies. At this time, the ink system was either water or solvent-based. Nilpeter has been at the forefront of innovative flexo printing presses within the narrow-web market for decades. In 1977, Nilpeter introduces the first full rotary flexo press to the label printing market called the F-200. And then in 1985, Nilpeter is the first to launch the UV-based flexo press to the market. The Introduction of the sleeve-based FA-Line for labels and flexible packaging creates a new industry standard within flexo printing in 2004. The inline UV-Letterpress was introduced in the beginning of the eighties, and both technologies had advantages over the other. Flexo was less expensive, had digital colour change (anilox), simpler print setting, lower web tensions, etc. However, the UV-Letterpress had finer screen (less transfer point and harder plates), instant ink curing, analogue colour control, constant colour strength, fewer wash ups, etc. UV-flexo was first introduced as an inline varnish process for the UV-Letterpress. This development made it possible for Nilpeter to supply flexo machines configured for running with UV-Flexo inks, thereby incorporating some of the advantages of the UV-Letterpress. In the beginning of the nineties, the developments of printing plates, anilox rollers, and ink for UV-flexo had reached a point, where the difference in print quality between the two technologies became smaller and smaller. In the mid-nineties the on-going development in UV-Flexo had reached a point where about 10% of the flexo presses were equipped for printing UV-Flexo. During the next decade, the number of flexo presses equipped for UV-printing raised to 90% of presses built. During that same period, the demand for new UV-Letterpresses was reduced, and the product line was discontinued due to the competition from UV-Flexo and from inline UV-Offset. Servo drives were first used in Nilpeter flexo presses in the mid 00s. At this time, the servo drives replaced main shaft and bevel gears, which were a weak point (vibrations, etc.) in flexo printing. In later press designs, servo drives have replaced not only main shaft and bevel gears but also format gears. This print head design with servo drive and steering by wire has brought the level of automation to a point, where job settings can be stored and reloaded with an accuracy, which brings the need for operator adjustments to a minimum. We now see an on-going development in plate and anilox technology, which will increase predictability of printing quality to a level, where the differences between flexo and offset is reduced. Another important point in the future is the current development in curing technology and inks. Today, the need for stability and accuracy of the press mechanics is pivotal, if the benefits of the electronic controls are to be fully exploited. There is no advantage to storing hundreds of positions of the moving parts, if the flexo press platform itself isn’t accurate. Nilpeter has chosen to invest in in-house manufacturing of parts to control the quality, stability, and accuracy across the product lines. This is the way forward to exploit new technologies such as IA, IoT, and remote diagnostics for instant support.